When Srivalli the initiator of the Blogging Marathon Group had set the themes for #81, and she came up with the theme Surfing Through the Caribbeans, she never thought that a natural calamity would literally surf through the Caribbeans. Hurricanes Irma and Maria have caused catastrophic damages to some of the Caribbean islands. Hurricane Maria followed Irma within 2 weeks barely giving the inhabitants of these islands time to get back to normal. It will takes years for some of these islands to get back on their feet. However, our well wishes are with them as many come forward lending time and money to rebuild these beautiful islands. For the next 3 days I will be cooking some dishes that are very much a part of their daily meal in some of these Caribbean Islands. My first stop is the Republic of Trinidad and Tobago, the twin islands. Famous for its carnivals, the birthplace of calypso music and steelpan. Ruled by Spanish, Dutch, French, and British before gaining Independence in 1962. After the Slave trade was abolished the colonists got East Indians, Tamils, Chinese, Portuguese labourers under the indentureship contracts. Thus Trinidad and Tobago has a diverse culture. This is also noticeable in the food where a herb like thyme is easily mixed with turmeric or coriander powder to give the local dishes its unique taste. My first dish for this theme is Doubles. Unique name but it tastes amazing. At first you may think that this is Chole Bhature (famous in Indian cuisine). However it tastes different and the flatbread too is prepared differently. Scroll down to check the recipe. Doubles is a famous street food in Trinidad and Tobago. It is a sandwich made with two baras filled with a chickpea or channa curry. Its made a bit spicy with scotch bonnet chili. As I couldn’t get that here, I just used normal chilis. Its wholesome, filling and fits in your palms. What pizza is to Italians, tacos to Mexicans, hot dogs to Americans, Doubles is for Trinidadians/Tobagonians or Trinis. Its usually served with a chutney made from chandon beni(bhandhania) a local herb or with other green chutneys, coconut chutney or the famous pepper sauce. Check out this song on Doubles by Kenneth Supersad. Mix flour, salt, sugar, turmeric powder, pepper powder, yeast and cumin seeds in a bowl. Add warm water and form a dough. Dust the worktop with little flour and knead the dough till it is smooth. Rub the bowl with some oil. Rub oil all over the dough and place it in the bowl. Cover and let the dough rise till its double in size. Gently knead the dough and divide it into 8 parts. Heat oil in a wok, Karai or a deep frying pan. Take one ball of the dough and using some oil pat it into a circle about 5-6″ in diameter. Gently slip it into the hot oil and fry on both sides till it is light golden in colour. Repeat steps 8-11 with the remaining dough. Soak the chickpeas overnight in warm water. Next day drain out the water, wash the chickpeas and put it in the pressure cooker. Add 2 cups of water and ½ tsp salt. Pressure cook for 3-4 whistles. Mix pepper, coriander, turmeric, nutmeg powders, paprika, and thyme together in a small bowl. Add chopped onion and stir fry till its soft and light brown in colour. Add garlic and chili paste. Stir fry for a few seconds. Add the mixed spice and herb powder. Mix and then add the boiled chickpea along with the water it was cooked in. Sprinkle the stock powder over it and mix well. Mash some of the chickpeas lightly. Let the curry simmer over medium to low heat till it becomes thick. Remember to stir it frequently. Spoon about 2-3 tbsp of the channa curry onto it. Add a dollop of chutney. Sprinkle some coriander over it. Top it with another bara and serve. A typical pepper sauce is made using habanero, scotch bonnet chilis with pineapple or mango, spices, vinegar and sugar. If you are using a scotch bonnet, add it whole to the curry as it is very hot. If you decide to chop it, use gloves. You can add chopped onion to the doubles when serving. If you use canned chickpeas then you will need either stock or broth. I used the water that the chickpeas were cooked in. I cup chickpeas after soaking gives 2 cups. Such a heartwarming post and I am so happy that you are blogging about the regions that really need all our thoughts and prayers. Coming to the recipe, this sounds so interesting and I would love to feast on this. This is a kind of street food that i would keeping coming back to. That really is so sad when we read about those natural calamities..hope they bounce back to normalcy soon..coming to the recipe, this is surely a fantastic one..looks so much like our own right..very good choice! True Mayari nature has her own plans for us. I love these doubles. The baras remind me of the buns made here. Must have tasted amazing. Doubles rocks Mayuri, makes me hungry rite now here. Seriously with all those Irma and Maria hurricanes have totally devasted some beautiful caribbean islands,am having couples of collegues from caribbean islands and lived those terrific moments with them. This is one of the most quintessential dishes from Trinidad. I have had it many times both from Trini restaurants here in NYC and in Trinidad itself as it is one of the most popular street foods there. I appreciate your research as well. I only tried to make bara once and mine did not come out as good as yours. You are inspiring me to try again!!! The similarity in food around the globe is amazing. Very informative post. I have these in my bookmarked list , I have made channa umpteen times , but somehow haven’t got around making these doubles . And I will come back to check more street food at your space . Lovely recipe with a different twist!! Indeed exploring global cuisine is really amazing.. 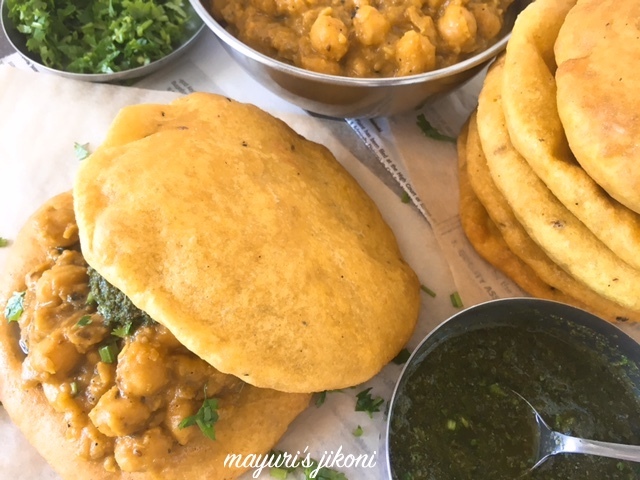 I m eyeing this to try for my next week theme mayuri, the name itself is so catchy and my god that chick pea curry between that bread, pure bliss, and your photos want me to eat it now! Thanks very much Mayuri for bringing this lovely, healthy and tempting recipe to MLLA for this month. I want to taste it now.Round-up will be on the 2nd of November.